WASHINGTON — The Army’s fiscal year 2019 budget request will grow by roughly 8 percent over last year’s request to fill readiness gaps, addressing both capacity and capability holes which must be filled to carry out the new National Defense Strategy, Defense News has learned. Doing the math, that means the Army is set to receive between roughly $13 billion and $14 billion over last year’s request of $166 billion. The Pentagon has already confirmed its topline budget request for FY19 will be $716 billion. The Defense Department plans to roll out its full request on Feb. 12. The top line is based on what the Pentagon believes it needs to execute the National Defense Strategy and was met favorably by both the White House and Congress, marking the first time in possibly decades where there was agreement across all three decision-making bodies. The Army’s budget in FY19 is about recovering from years of debilitating cuts that damaged force readiness, but it’s addressed in a different way than it was during the Obama Administration, a defense official said. It’s not just about how many Combat Training Center rotations the service is doing, it’s about addressing a wide range of programs and efforts that were cut or underfunded in the past from training to capacity to capability. The service will continue to grow the force at a modest pace. The Army grew somewhat erratically in past years with congressional mandates to plus-up troops by 16,000 in one fiscal year followed by 7,500 in another after several years of having to draw down the force. The current force size is 483,500 and the plan is to increase the end-strength steadily by 4,000 a year for three years, ultimately reaching a force of 495,500 by 2021. While the active Army will grow, the reserve forces will not. Yet, the reserves will increase its full-time support, meaning more “citizen soldiers” will be full-time. 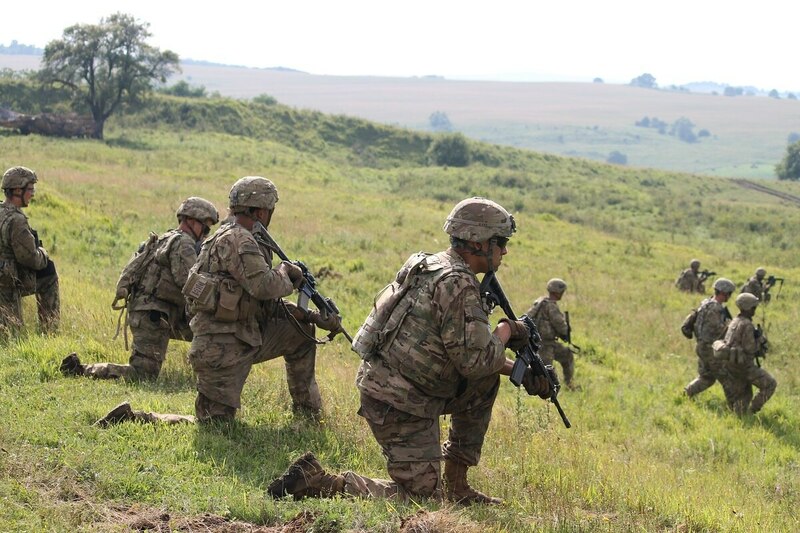 The Army National Guard and Reserves requested to have more full-time support within its forces because they believe it will help them with their readiness, according to a defense official. Another way the Army is tackling readiness in its FY19 budget request will be through funding increases in air defense, long-range fires, electronic warfare, cyber and its new Security Force Assistance Brigades (SFAB) accounts. Looking across the formations, those are the types of capabilities that are missing because the Army did not invest in them, in some cases, for over 40 years. Fighting a land war in Europe against a peer competitor, for example, would require a rapid reinvestment in those areas. Because the National Defense Strategy calls for a much more credible focus of forward-deployed forces, the administration is increasing the European Deterrence Initiative (EDI) — formerly known as the European Reassurance Initiative (ERI) — which has received large boosts every year since its creation in FY16. In FY17, the ERI fund amounted to $3.4 billion. A total of $2.8 billion was for the Army. And in FY18, the DoD requested $4.8 billion with an Army portion of $3.2 billion. The Army is expected to, yet again, get the biggest piece of the pie. The EDI account was created to reassure Eastern European allies and deter Russia from further incursion into Europe following its illegal annexation of Crimea and continued aggression in the region. Increased funding will cover more exercises, more forward presence and more improvement of the equipment that is forward-stationed. Now that the funding is focused on deterrence of Russian aggression rather than reassuring allies, more will be injected into munitions, improving tanks and Bradley Fighting Vehicles and priming the pump for a larger rotational presence in Europe that would be episodic and not always predictable. The budget will not contain a request for additional troops in Europe in 2019, but more troops will be funded in 2020 when the Army begins a more dynamic employment of forces, which might include periodic exercises with multiple brigade combat teams and divisional assets. 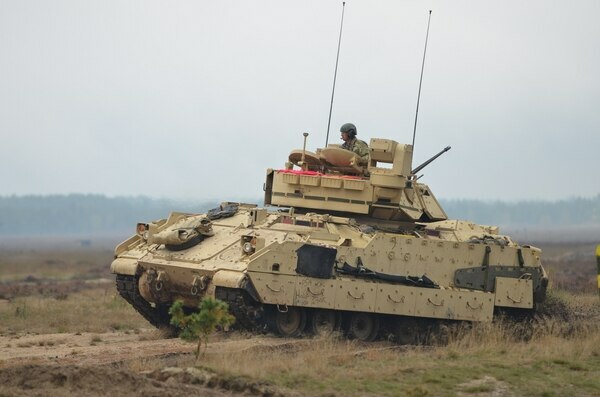 And like the episodic and unpredictable rotational deployments, exercises will take on the same characteristics and will start to test the ability to withdraw and use the Army’s prepositioned stock in Europe, which by 2020 will be fully upgraded and complete. The Army is drastically increasing its ammunition production, investing $22 billion from FY19 through FY22. Previously in the FY18 through FY22 five-year plan, the Army was planning to spend $13.3 billion. Years of budget cuts have led to a growing shortage of munition production to restore what the Army has expended in various contingencies. The service is expected to request a large amount of Guided Multiple Launch Rocket Systems (GMLRS), as well as Patriot Missile Segment Enhancement (MSE) missiles. The Missile Defense Agency will also procure more Terminal High Altitude Area Defense (THAAD) interceptors. The request also will include funding for one and a half armored brigade combat teams to be modernized. The previous modernization rate was just one ABCT over three years. The Army has 20 ABCT equipment sets, but before last year’s budget request, five of the sets hadn’t seen updates to its tanks or Bradley since Desert Storm. Both the FY18 and FY19 budget invests heavily in modernizing two ABCTs. While the Army is standing up its new Futures Command this year, significant funding for programs that meet the service’s top six modernization priorities will not be seen in 2019 in procurement or development accounts. Many of the programs that will provide leap-ahead capabilities like Future Vertical Lift and the Next Generation Combat Vehicle won’t need that kind of funding for many years. FVL, for example, isn’t expected to reach a production decision for at least another decade. But the science and technology funding will set the stage for those modernization priorities in 2019. The Army realigned its science and technology budget at the end of 2017, moving between $1 billion and $2 billion across the future years defense plan (FYDP) — or five-year budget plan — from near-term counterinsurgency (COIN) S&T efforts to longer-term projects aligned with the priorities.